No matter how old you are, there’s nothing quite like the magic of Christmas; from waking up at the crack of dawn and loudly stomping through the house to wake everyone else up because you can’t contain your excitement, to stuffing your face with as much food as you can get your hands on, to gently sipping mulled wine by the fireplace when you can no longer move after indulging in a Christmas feast and watching the kids open every box, one after another, because they simply cannot wait another second. The festive season is all about spending time with family and friends, laughing until you cry, but, more importantly, it’s about giving more than just gifts. Whether you’re eight or eighty, Christmas is the most wonderful time of the year. 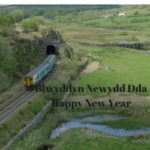 From all of us here at the Conwy Valley Railway, thank you for a wonderful year and we wish you a train load of best wishes and a magical Christmas!